The Seeds of Learning US office is located in Sonoma, CA. When the devastating Northern California wildfires began to burn last October, many of our volunteers, staff, and board members were directly affected. In the aftermath of the fires, our neighbors and communities have begun to recover and rebuild. SOL board member Mark Etherington has led many work groups to Central America, and understands that at the heart of every SOL volunteer is a desire to make a difference and work together for the common good. With this in mind, Mark reached out to SOL volunteers to coordinate a way for us to directly participate in the recovery efforts in our local community. Under Mark’s leadership, two large groups were organized to volunteer at the Redwood Empire Food Bank (REFB). These groups consisted mainly of SOL volunteers, staff, and board members, all eager to lend a hand! 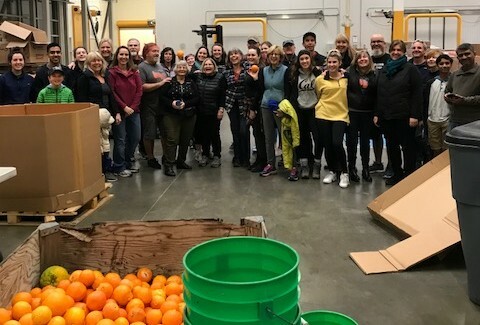 On Jan 13th, the volunteers spent several hours in the food bank warehouse bagging up oranges. On Feb 10th, the group worked to package up apples. The fruit was then distributed to families in need throughout Sonoma County. Mark is continuing to plan local volunteer projects with REFB and other organizations. The next project is scheduled for March 24th at REFB. Please contact us if you would like to participate at info@seedsoflearnign.org. A huge thanks to Mark and the many volunteers who have participated in these projects!